It is the first time this has happened to me, honestly. I am embarrassed. I failed to find skiing on a trip. Granted, this trip was more difficult than most. Venice is a hot place in the summer. Due to some other travel and work I was unable to spare extra days or even hours to do the detour via the summer ski places in northern Italy. And the two days that I was there were filled with meetings from early morning to dusk. I did have a great plan, however. 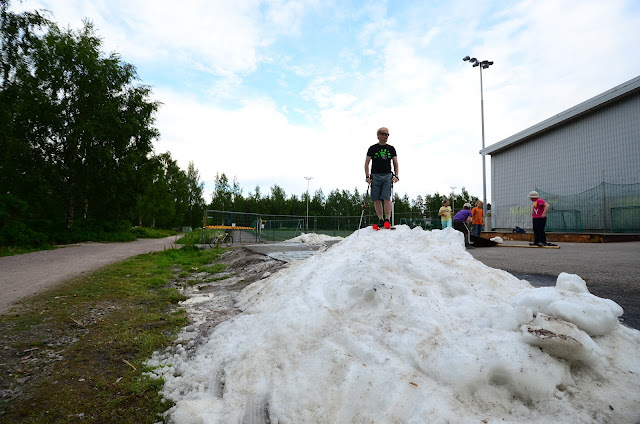 Last week I found some snow from the Matinkylä indoor ice rink. My idea was to find an indoor ice rink near Venice, gather some snow to plastic bags, drive to Venice and park my car at Piazzale Roma when they are empty at 3AM. And then I could have spread the snow on one of the small bridges nearby, and skied on the bridge. But I failed to find an ice rink. WTF? Not a single open-in-the-summer ice rink in the area? 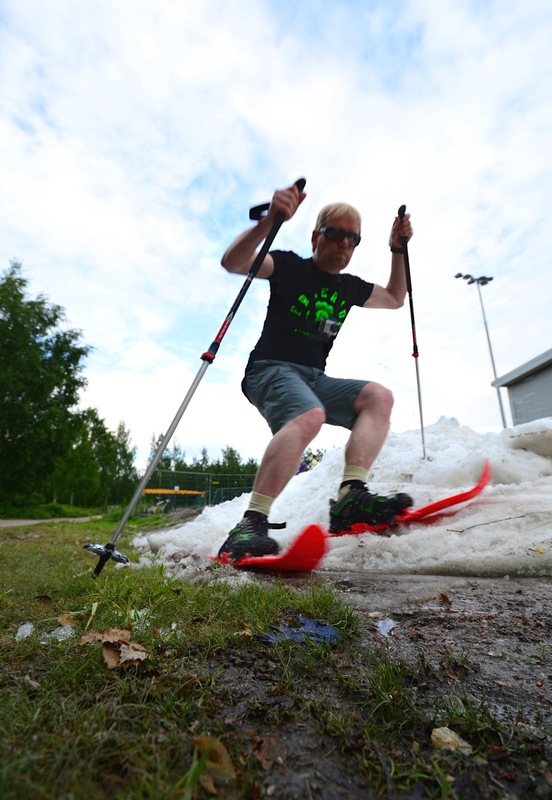 I can only conclude that Matinkylä tops Venice as a tourist destination, if it comes down to availability of snow and ice. 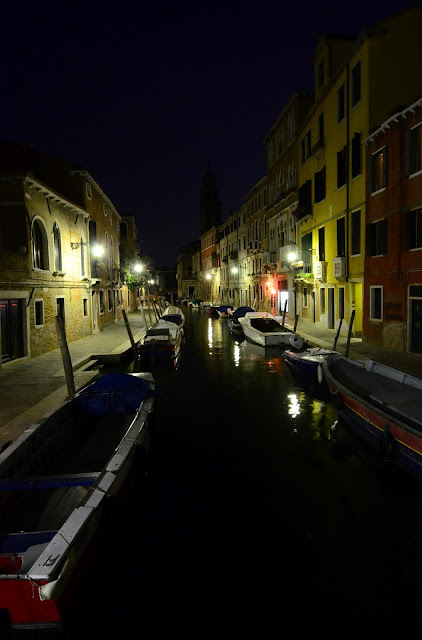 Who cares about those canals anyway? 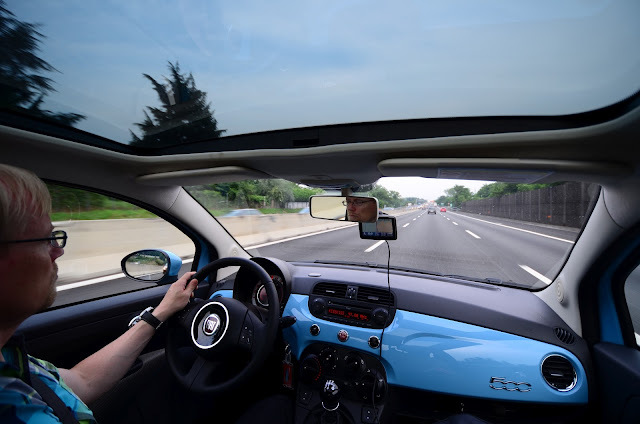 Driving to Venice on the rental Fiat 500. Cheap, small, and very nice! 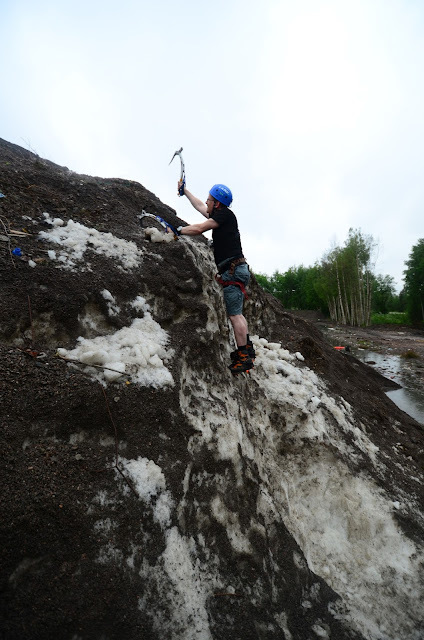 Ice Climbing in Espoo. In June. 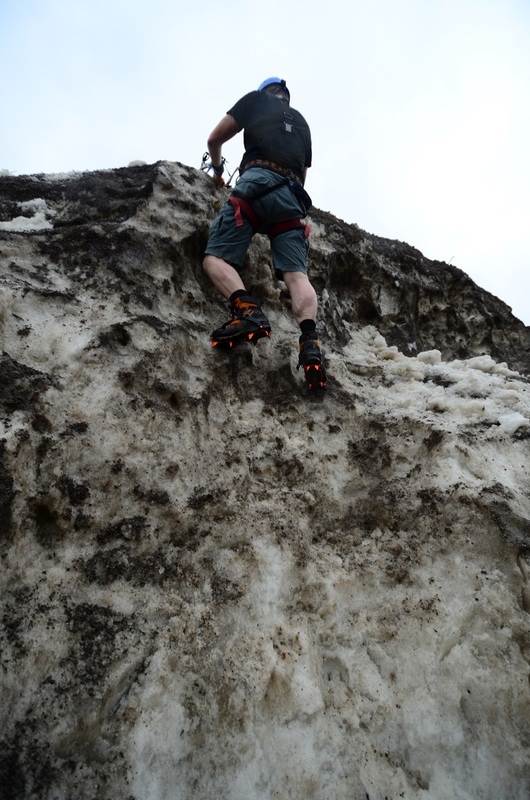 Summer ice climbing. Yes, there is ice underneath. It is Sunday, +10 degrees, raining heavily, and it is the middle of summer in southern Finland. What should I do? 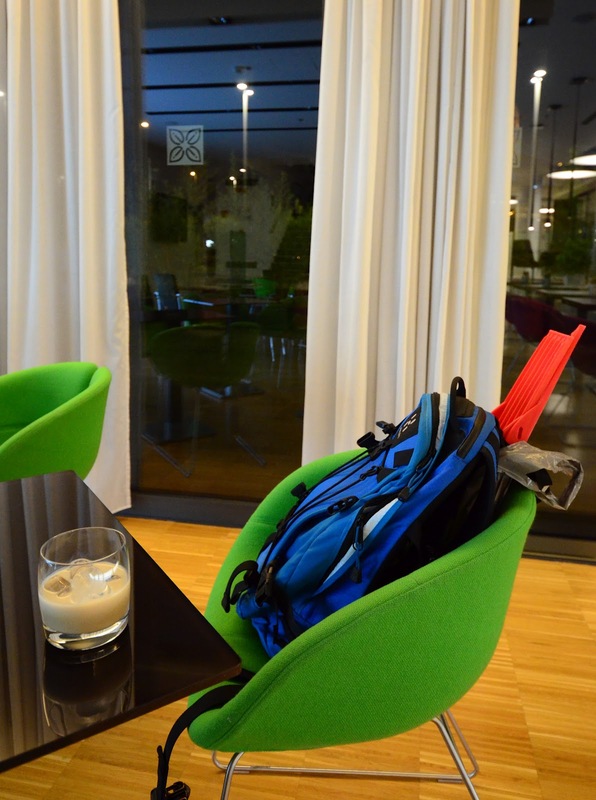 Go ice climbing in Espoo, obviously. Where there is a will, there is a way. It turns out that you can go ice climbing at any time of the year, just a few kilometers from my home. 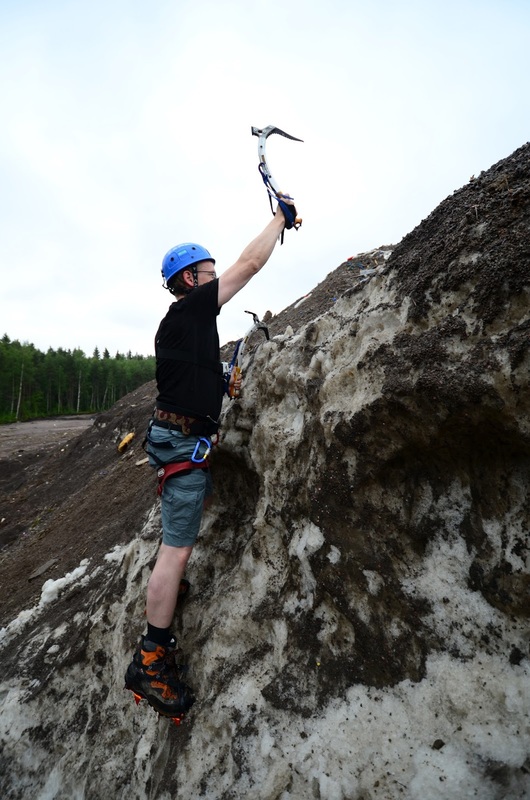 As my friend Jarmo put it, this was a typical summer weekend in Espoo: skiing on Saturday and ice climbing on Sunday. 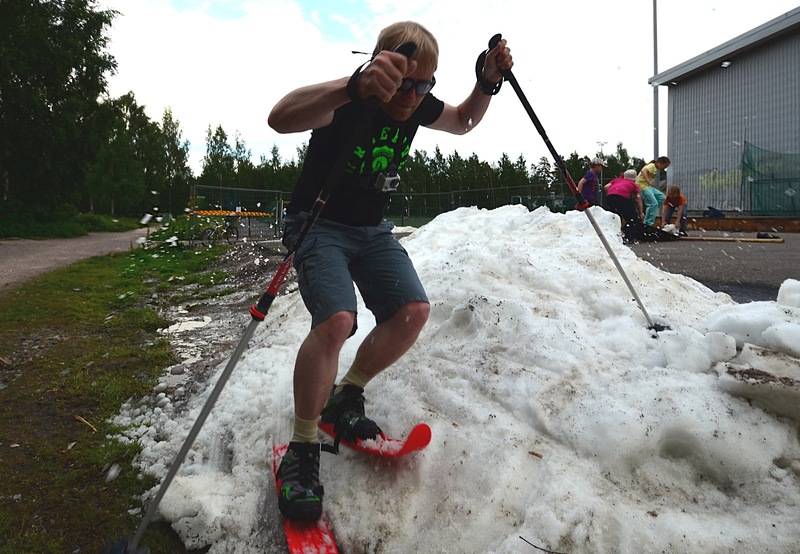 Jarmo had found a snow dumping ground on his runs through Mankkaa. 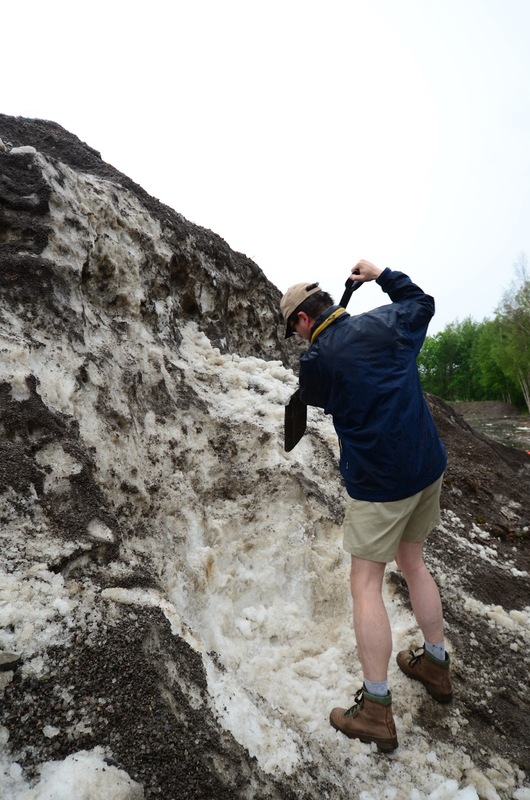 Even in the middle of the summer, there are 10 meter piles of snow in this area. The only problem is that they are covered by sand and garbage. No matter. I brought a shovel. After an hour or so, we have a reasonable 3+ meter ice wall. There was a short break in the rain just when started climbing. The climbing was nice, though of course it would have been better with an even higher wall. 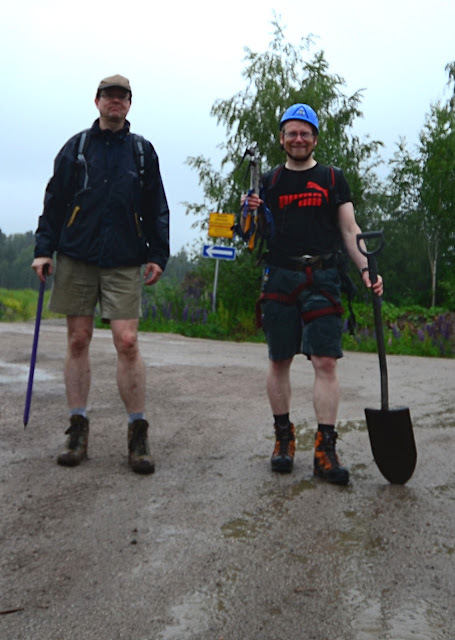 But the height was up to us... we could have digged for another hour and reached maybe 5 meters. The ice was quite variable. 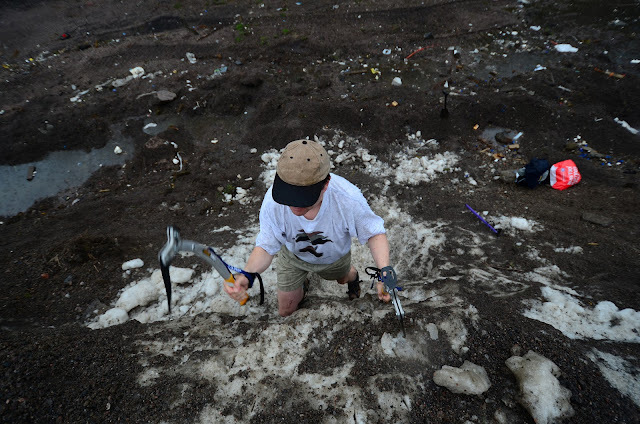 In some places it was rock hard, in other places it was rotten or snow. This made the climbing interesting. We also had to avoid damaging our tools by hitting areas that had sand. Or worse; snow dumping grounds get all kinds of garbage, such as concrete road barriers and the like. We had to be careful to not cause an avalanche of garbage on our heads. Reaching the top. Note the lake behind. The location can be found from this link. When you drive on Mankkaantie towards south, you'll reach an intersection for Tapiola Golf just when the name of the road changes to Turvesuontie. The golf course is on the right, and the dumping group is on the left. Immediately after the intersection there is a small area where you can park your car. It is probably a good idea to visit only during weekends and off-hours, as heavy traffic to the area may find that your car is on the way. Note that there is some activity even during the summer. Wear good shoes and be careful in the area. The piles of snow come with all kinds of junk. 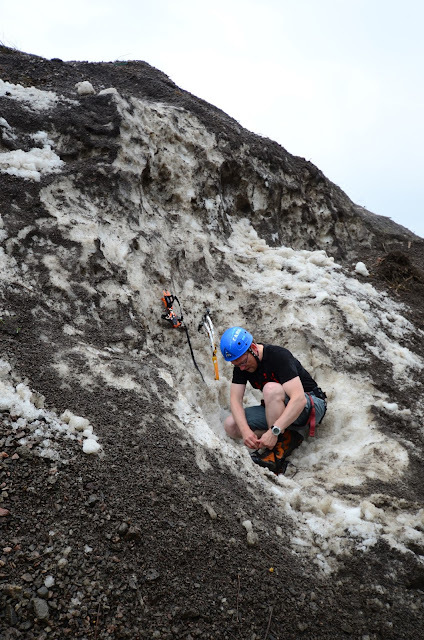 At the time that we were there today, the highest snow piles and steepest walls were on the back side of the area. The area may also be useful in other times of the year. 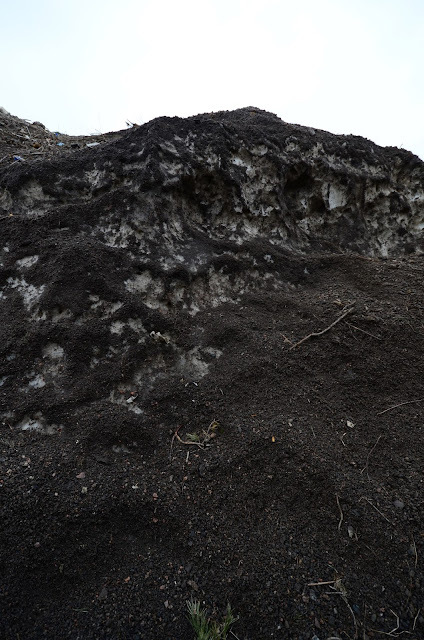 In the winter the piles of snow are very high, and might be usable for some short ski runs. We went to Matinkylä, southern Espoo today. One of the largest shopping malls in Finland, Iso Omena ("Big Apple") is located in Matinkylä. 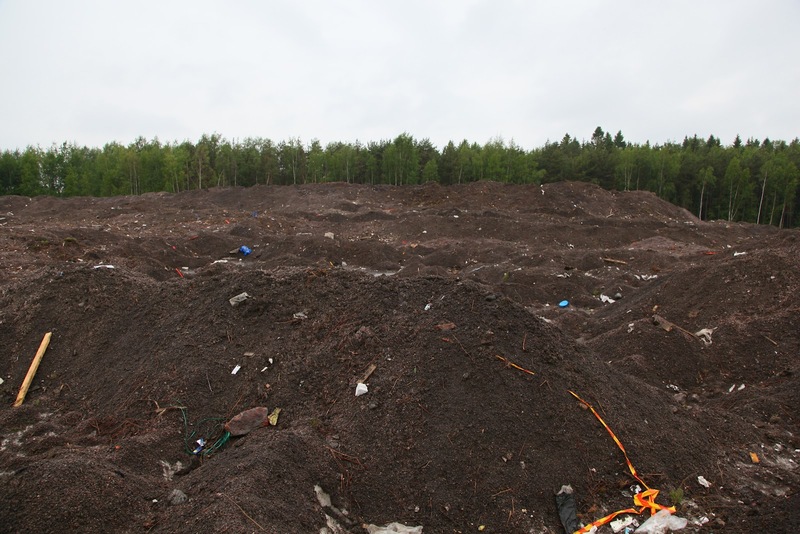 But they are also known as the site of M2, a mountain with icy slopes even in the middle of the summer. The steep slopes of M2 rise a whopping two feet above the surrounding landscape, scaring skiers and mountaineers alike. Indeed, very few climbers have climbed it. Seriously though, natural snow had been gone for a couple months by now, but there was an ice rink. Ice rink maintenance produces some snow as a side-effect, and I've been searching for a rink that would be open during the summer. It turns out that the rink in Matinkylä is open. And surely enough, they had a pile of white snow outside, in the sunny, +25 degrees summer day! Given the short ski slope, we decided get some extra exercise by heading there with our bikes. 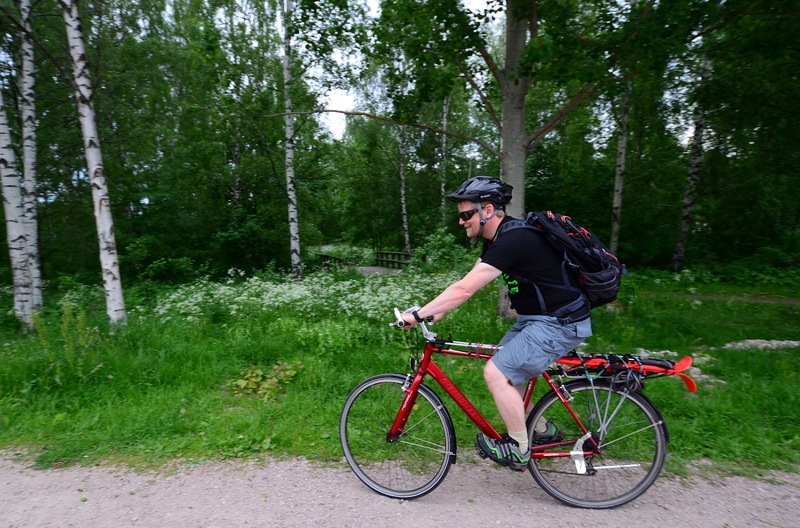 This gave Janne and me a nice 20 kilometer bike tour. The miniskis do have one advantage, however. 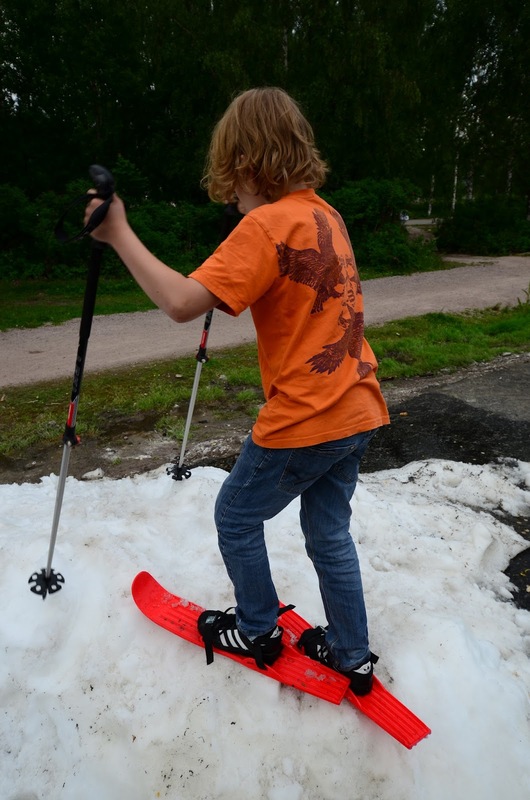 They are much easier to transport on bikes than regular skis. Cost of lift tickets: 0 €. Plenty of other activities available nearby, a children's playground, gas station with a restaurant, and of course, an ice skating rink. And a shopping mall.